The launch party featured readings by Creative Writing MFA students Sarah Basil, Adam Carter, and Casey Clague, and alumni Melissa Carroll and Annalise Mabe. 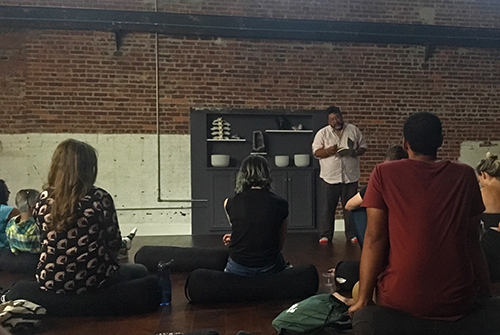 Speakers read nonfiction, flash fiction, and poetry in their bare or stocking feet, and most audience members sat on yoga blankets and bolsters. Sukrungruang concluded the event by reading an excerpt from and signing copies of his new book. "Buddha's Dog & Other Meditations," published by University of Tampa Press, is his fifth book and third book of nonfiction, one of which won an American Book Award in the General Nonfiction category. USF English professors Ira Sukrungruang and Rita Ciresi will be reading from their new books for an MFA reading event Sept. 28 from 3-5pm in the Library’s Grace Allen Room.